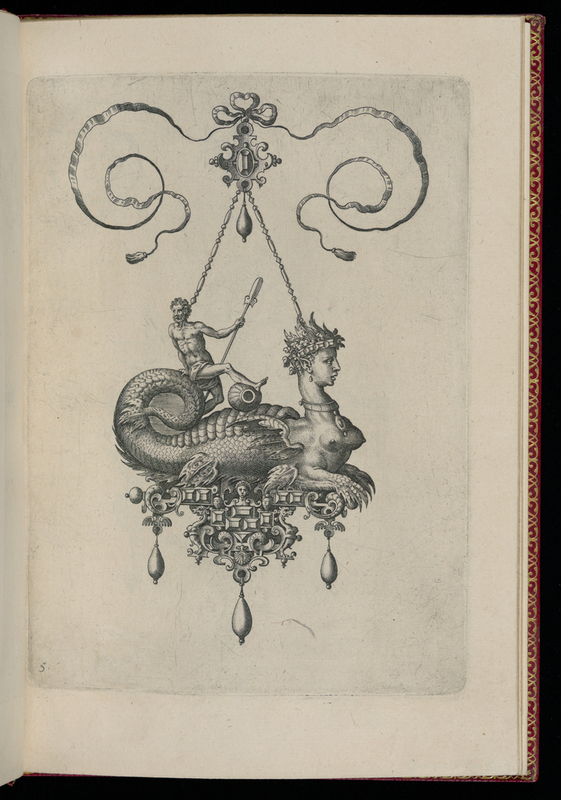 An oarsman reclines on a sphinx’s scaly tail in this design for a pendant. Enameled, bejeweled, and dangling from a noblewoman’s gown, the imperious sphinx would appear fully tamed. Like the other marine monsters in this series of pendant designs by Hans Collaert, she symbolizes the sea’s abundance, harnessed by Flemish fishermen and merchants. These prints, engraved by Hans’s son, Adriaen Collaert, would have been disseminated in and around the family’s native Antwerp—a center of Netherlandish jewelry production. Adriaen’s careful hatch marks reveal the range of textures and surfaces envisioned by his father. Goldsmiths, enamelers, and gemcutters would have worked together to realize his complex design. They would carve precious stones to stud the pendant’s base, and shape gold into the delicate ribbon at its top. The sphinx’s tail and claws may have been coated in lustrous aquamarine enamel, and her body formed from a huge pearl. Many pendants from this period feature irregularly shaped pearls, known as baroque pearls, whose organic curves posed a challenge to jewelers—how best to shape such lumpy objects into naturalistic designs, dictated by Renaissance ideals of beauty and proportion? Below are some of their most inventive solutions. Note how the baroque pearls are equally suited to the wooly body of a sheep and the clammy, iridescent skin of a sea creature. The late sixteenth century saw a craze for pendant jewels like this one, and they embellished court finery throughout Europe. They naturally signified status and wealth, but also invoked virtues, identified family dynasties, and were exchanged as tokens of love. Pendants glinted on the gowns of Medici brides and hung from the hat brims of Hapsburg queens. The Tudor lady below sports six at once (three in her coiffeur alone). Collaert’s pendant is designed accordingly: suspended on chains, the sphinx and her rider would sway as the wearer moved, simulating waves. Its four pendulous pearls would quiver at the slightest gesture, catching the light and attracting the eye. Hieronimo Custodis, Elizabeth Brydges (Detail), 1589. Courtesy of Woburn Abbey. The pendant on her left shoulder includes a baroque pearl.